Well, I havn't been posting lately....major computer crash! Ugh! Well, I'm here now, and I am just going to do a quick post, as 4 of us are sharing 1 computer. Recently, I purchased a used Clarinet. I really want get back into music, and teach my kids. I am mainly a woodwind, but played (20 years + ago) several instruments. I chose to start with a clarinet because it is the least expensive to buy used. 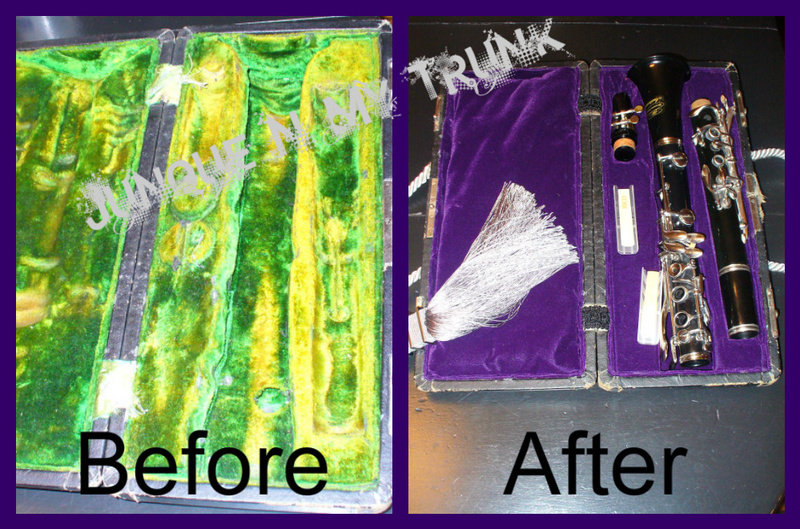 The Clarinet I bought on E-Bay, was in decent shape, but the case was verrry musty. Something you can not tell by looking at a picture. The green velvet interior was also faded and rotting. I bought a deep purple velvet, and some grey-ish silvery cording to make a handle. I also bought a decorative curtain tie back - mostly because I needed to bling-it-up. Next - is the outside of the case!